Shell Scotford Manufacturing Facility, Sept. 2014. Photo: Julia Kilpatrick, Pembina Institute. In February, Environment Canada presented a series of images related to air quality in Alberta at the Oil Sands Monitoring Symposium. The Alberta Environmental Monitoring, Evaluation and Reporting Agency, which hosted the symposium, recently posted the full suite of images, including videos, online. A picture is worth a thousand words, and that’s certainly true in this case. Many of the images show air emissions modelling results across the entire province — something that can be hard to grasp otherwise. In particular, these images show the dispersion and deposition of sulphur dioxide (SO2) and nitrogen oxide (NOx) emissions, which are of particular concern to the public for health reasons. A detailed explanation of what’s happening in the video can be found at the bottom of this blog. SO2 and NOx emissions impact human health not only because they can cause direct harm, but also because they can react in the atmosphere to create fine particulate matter (PM2.5). The Alberta government has found that NOx and SO2 are the main causes of past incidents where PM2.5­ concentrations have exceeded Canada’s air quality standards. These images underscore the cumulative impacts of a small number of very large industrial emissions sources — particularly coal plants, the oilsands and refineries — in addition to distributed industrial activities such as oil and gas operations. Those may all be separate sources, but their emissions end up in the same air. Pollutants from these different sources mix together in the air Albertans breathe, resulting in increased risks to human health. 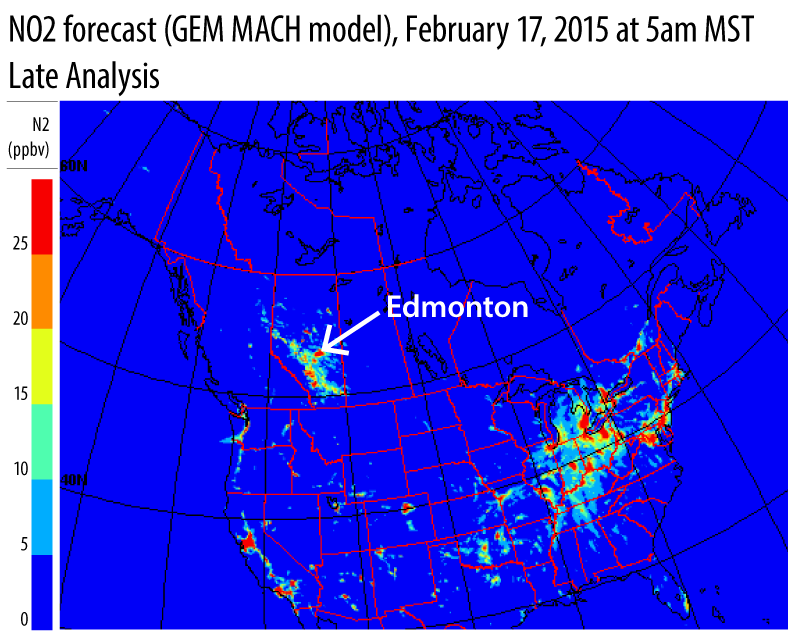 The image below shows NOX levels in ambient air in Alberta. The scale runs from blue (for the lowest concentrations) through yellow, and then to red (for the highest concentrations). Alberta is unique in the western half of North America for its mid- and high-level readings. The province more closely resembles the densely populated mid-Atlantic region of the United States, or the coal-burning Midwest, than our western neighbours. The data used for the oilsands is from 2010, so it discounts the emissions growth in that region over the last five years. The data for the rest of the sources is from 2006. In terms of coal emissions, these images correspond closely to today’s reality: NOx and SO2 in 2014 are at nearly the same levels as in 2006. The new provincial monitoring agency, AEMERA, is living up to its mandate by disclosing this data from Environment Canada. This type of information is crucial for understanding how the impacts of air pollution sources add up. That, in turn, allows for better policy decisions to protect Albertans’ health — be it deciding what new industrial projects should be approved, or weighing the benefits of replacing coal plants with cleaner alternatives. Joe Vipond is an emergency room physician and member of the Canadian Association of Physicians for the Environment.